An interesting opening on Sunday evening appears to be purely technical but with a news based catalyst. (Ukraine/Russia tensions). SPs had traded two days low to high and had a Sell Short day on the 2-period ROC. 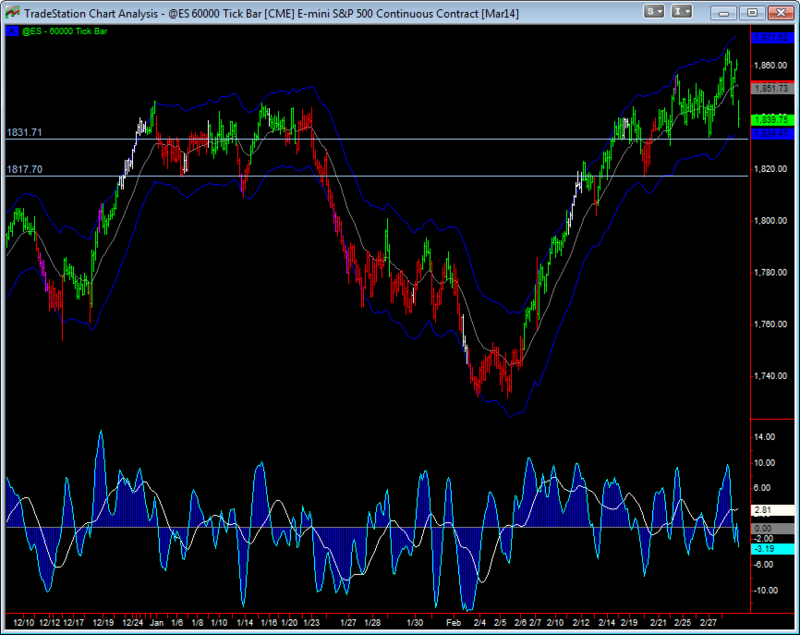 The chart above shows three pushes up on a 60000 tick but still within an overall uptrend. The Russell dropped below the 5 SMA but the first close below a 5 SMA can still find support. After multiple days in an up trending channel, a sharp downdraft does not damage the integrity of the uptrend. Tops are a process of lower highs and lower lows or overall distribution. The market may be overbought and display a loss of momentum, but major tops are rarely made on news events. Crude has been forming a bullish consolidation pattern. 108 is still the big picture upside projection. Gold has been forming a bullish consolidation pattern with higher lows and higher highs. Silver held the daily EMA and has a bull flag on the daily charts after an upside breakout from a sideways line. The big picture point and figure charts suggest 2800 to the upside. A lower high and lower low on the 120/240 minute charts would change this picture. This is what happened to the copper market so this is a good example to reference in terms of analyzing structure. Copper has been in a clear down trending channel after taking out the low of an A B C down on the 120 minute time frames. I say this because I was so vocal when it put in the 2nd higher low off the previous bottom on the 120 minute charts. Even though we can have upside projections, it is still a process of following the 2-3 day swings and following the market. So much movement has already happened Sunday evening – how will Monday unfold? Gold and silver are the first day back up…. Bonds and tens – watch the retest of the previous swing low on the yield charts: reference TYX and TNX. Grains – trend resumption. Even if markets gap UP Monday morning, traders can still watch for an intraday pullback to buy.